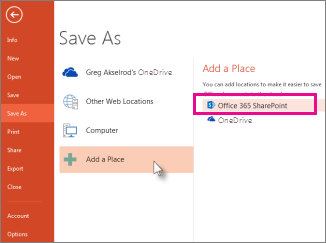 If you have a SharePoint account, you can save your PowerPoint files to a single location, and then use the Share command to let others read or edit your copy of the file. No more file pile, just one copy with everyone's feedback. Exactly what they can do to your file depends on the access you give them. Here's the process from start to finish. Skip ahead to the section you need. Start by adding SharePoint to your list of places in PowerPoint. In PowerPoint, click File > Save As > Add a place. 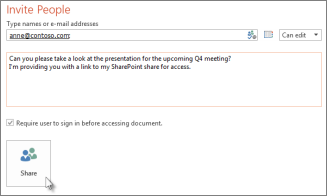 Under Add a place, click Office 365 SharePoint. Complete the Sign in screen that appears. You may need to contact your IT department for a user name and password. Tip: The new SharePoint place appears under Places in the Save As pane. After you add a cloud location to your list of places, you can share your presentation. You only need to do this once per file. Open the presentation you want to share. Under Save As, double-click your SharePoint document library. Give the file a name and click Save. Click File > Share >Invite People. Enter the email addresses of the people you want to share your presentation with. Click Can Edit to allow your coworkers to make changes to the file. Click Can View to allow your coworkers to view a read-only copy of your presentation. Enter a message in the box below the address line, and then click Share. If you've already saved a file to SharePoint, follow these steps. Click File > Share > Invite People. Open the presentation you don't want to share anymore. Under Shared with, right-click the person you want to stop sharing with, and click Remove User.